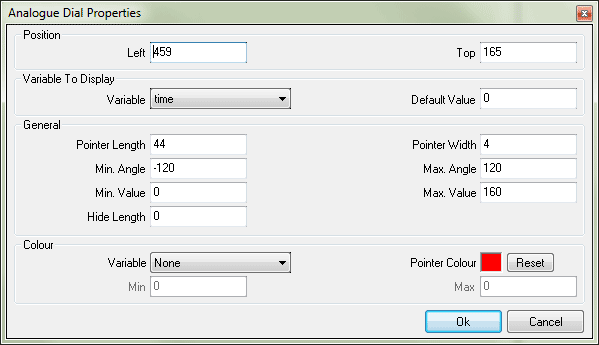 Variable (combo box) – This allows you to select the input variable. At run time the current value of the variable will be displayed by way of a rotation of an analogue dial. This property can be changed by dragging and dropping the appropriate variable from the variables pane in to the body of the control in the design area. Default value (textbox) – This is a default value assigned to the variable at start-up (when the overlay file is loaded). This will be used to generate the sample that is displayed on the design area. Go to the examples section on how these values can be manipulated to draw a dial of your choice. Variable (combo box) – the colour of the dial can be based on variable. By selecting a variable the colour property is disregarded. Based on the value of the variable, colour of the dial will change from blue to red as indicated by the below image.